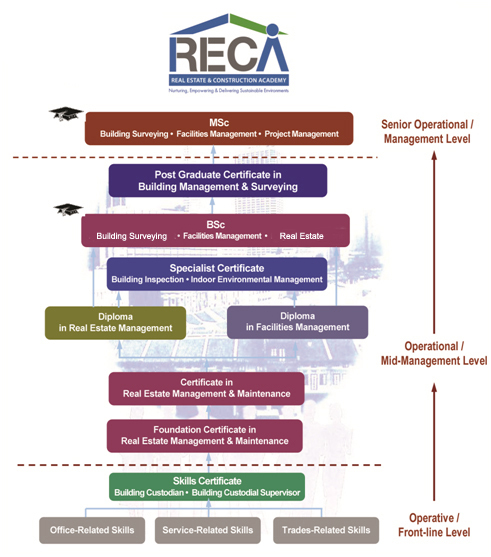 RECA training is underpinned by a Real Estate/ Facilities Management (RE/FM) Training Framework, Training Model and Lifelong Learning (LLL) Roadmap. LLL enhances the employability of the workforce by continual updating and improvement of knowledge, skills and competencies and is necessary for workers to stay competitive. The Training Model depicts the continuum from General to Core to Specialist skills, and the sociological-technological-commercial interfaces and links that will be reinforced in the training. A modular structure and certification has been adopted for courses at all levels to allow trainees to study at a pace as determined by personal and educational attributes, time availability and/or work schedules. The modular structure also permits recognition of prior learning for exemptions. The applied academic courses ranging from Certificates, Diplomas and Post Graduate Certificates on the roadmap are recognised for advanced standing in built environment tertiary programmes and to eventual membership of professional bodies.